HENRY FORD’S BANKRUPTCY | Jeffrey B. Irby, P.C. 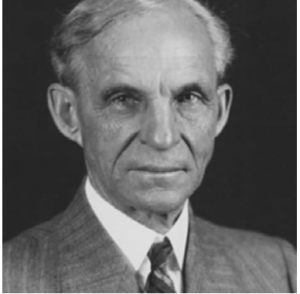 Henry Ford, the great entrepreneur responsible for Ford Motor Company, declared bankruptcy … twice. Before finding Ford Motor Company, Henry Ford, along with financial backing from Detroit Mayor William Maybury, William H. Murphy, and Senator Thomas W. Palmer, founded the Detroit Automobile Company. What happened next is up for debate: His investors worried that Ford could not put a car on the market; Ford said that his investors were driven by pro t rather than innovation. Again under Henry Ford’s leadership, the now-defunct Detroit Automobile Company reorganized as the Henry Ford Company in late 1901, not even a year later. But in 1903, it, too, was headed for bankruptcy. A few months later, Ford founded Ford Motor Company, and third time proved to be a charm. Of course, Ford Motor Company was close to bankruptcy during the financial crisis of 2007-2008, but by 2017, it was exceeding Wall Street expectations. Henry Ford’s story is one of perseverance. Ford did not allow his bankruptcies to deter him. Rather, they were vehicles (pardon the pun) that allowed him to continue making business decisions. Ford recognized that bankruptcy offered a second—and in his case, a third— chance, and he took hold of this opportunity. Most people believe that bankruptcy represents rock bottom, but I disagree. I believe that bankruptcy is the vehicle that allows you to recover from rock bottom. If you are suffering from a financial meltdown, and you do not have a clear path out of the chaos, your financial situation will likely not improve in the coming years. You will face the constant pressure of having creditors breathing down your neck. You will worry about whether your utilities will be turned o for non-payment. You will cringe every time the phone rings. When you declare bankruptcy, though, you get to make choices without this constant pressure. Your life feels easier because it is easier. Your responsibilities become more manageable. Here is the truth: If your bills are piling up, and you have no way to pay them, bankruptcy might be the best vehicle available to you. It gives you a chance to wipe the slate clean and start over. In other words, you will not recover from bankruptcy; you will recover through bankruptcy.